BotDetect™ prevents automated submissions of WordPress forms using CAPTCHA images. The BotDetect PHP Captcha WordPress plugin integrates seamlessly with WordPress login, registration, lost password, comment forms, and Contact Form 7. 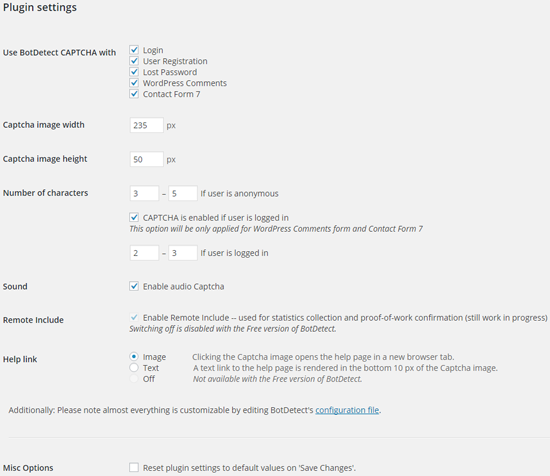 This high-security Captcha protection is packaged as a simple WordPress plugin which is easy to install and configure. Adding BotDetect Captcha protection to your WordPress login, registration, lost password and comment forms only requires ticking a checkbox on the plugin settings page. For the list of features please visit our main BotDetect PHP Captcha page. The BotDetect PHP WordPress Captcha plugin settings page allows you to configure whether Captcha validation will be required on each supported form (login, lost password, etc. ), and other common settings. The Use BotDetect CAPTCHA with section of the plugin settings allows you to specify which of the supported WordPress forms will include Captcha validation. Please note that if the visitor is already logged in, no Captcha challenge will be displayed on any form regardless of these plugin settings. You can also use the plugin settings page to specify the Captcha image dimensions, Captcha code length, toggle audio Captcha on or off, and change a few other Captcha options. Other Captcha related settings (and virtually everything is customizable) can be configured by editing the CaptchaConfigDefaults.php file located in /wp-content/plugins/botdetect-wp-captcha-free/botdetect/. You can find a full list of available Captcha configuration options and related instructions at the Captcha configuration options page.